Contact Neil now for a complimentary copy of Legacy Magazine (while stocks last). 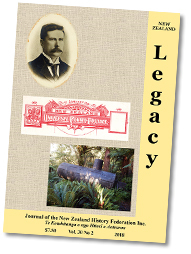 NZ Legacy is the official journal of the New Zealand History Federation, published twice a year. This journal has been published since 1989, and is probably the longest continuously published heritage magazine in New Zealand. A subscription for one volume of three issues costs $30 including postage within New Zealand. A subscription to NZ Legacy is included in NZHF membership. William Joseph Napier (1857-1925): lawyer, public figure, politician and Devonport resident. The Boilers of Preservation Inlet: not monuments but relics of past endeavours. Favona - Telling the Story. Click here for contents of recent back issues.